Map is inspired by the new book Bob Dylan FAQ by Bruce Pollock (the book has been uptil now under the radar and deserves more attention). The data are partly from this book, the Bob Dylan website and the setlistwiki. Please note that the data of the number of times songs are played differ in the sources used. 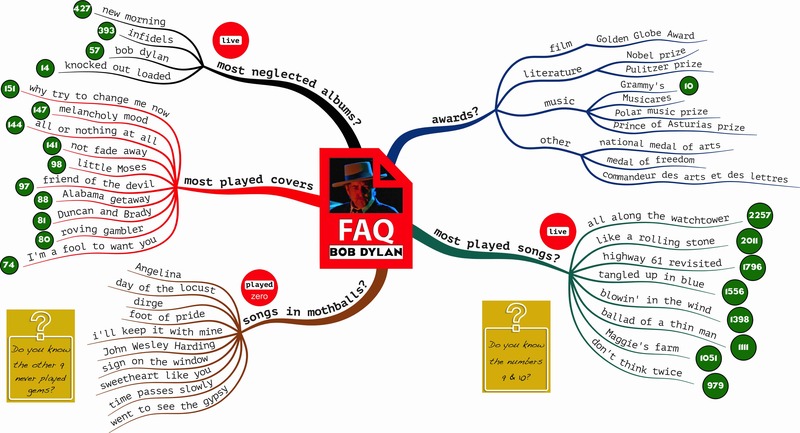 This entry was posted in mindmapping, music and tagged awards, Bob Dylan, Bob Dylan facts, Bob Dylan FAQ, gems not played live, live, most neglected album, most played covers, most played songs. Bookmark the permalink.